Institute of Chemical Technology, North Maharashtra University, Jalgaon -425001. Recently, surfactants have become one of the most important chemical products. They have become a subject of research, and their production and their use are on the increase. 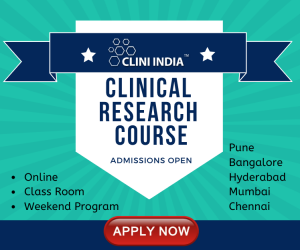 This wide range of properties, uses for surfactants in pharmaceutical products and systems is to try and introduce and explain in the subject of this article. Wetting of Solids, Solubilization, Emulsification, Dispersion of solid in solution, Micellization & Detergency all these are properties of surfactant. Surfactants are classified according to their polar head group, the charged head referred as Ionic surfactants and uncharged surfactants are generally referred to as nonionic surfactant. Because of their unique functional properties, surfactants find a wide range of uses in pharmaceutical preparations. These include, depending on the type of product, improving the solubility or stability of a drug in a liquid preparation, stabilizing and modifying the texture of a semisolid preparation, or altering the flow properties of a granulate, thus aiding in the processing of the final tablet dosage form. In addition to their use as excipients to improve the physical and chemical characteristics of the formulation, surfactants may be included to improve the efficacy or bioperformance of the product. The properties of surfactants are such that they can alter the thermodynamic activity, solubility, diffusion, disintegration, and dissolution rate of a drug. Each of these parameters influences the rate and extent of drug absorption. Furthermore, surfactants can exert direct effects on biological membranes thus altering drug transport across the membrane. The overall effect of inclusion of a surfactant in a pharmaceutical formulation is complex and may be beyond those initially intended. Surfactants may reduce the effectiveness of antimicrobials or preservatives included in a formulation. Surfactants are widely used in molecular biology in formulating new and in modifying existing medical preparations, in the production of proprietary medicines, in the production of chemical preparations aimed for the domestic use, etc. All this is understandable since the properties of surfactants are to some degree responsible for the existence and the performance of cellular membranes, emulsification, solubilization, and of transport of compounds that are otherwise insoluble in living tissues. Surfactants also function as film formation promoters, as wetting agents, detergents, bactericidal agents, etc. The number of specialists interested in surfactants is indeed very large and the literature devoted to surfactants is correspondingly wide. However, an adequately comprehensive and contemporary monograph on surfactants is currently not available. 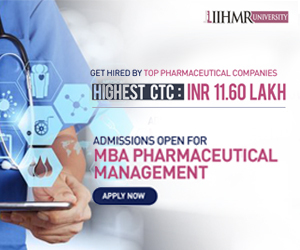 This wide range of properties, uses for surfactants in pharmaceutical products and systems is to try and introduce and explain in the subject of this article. Atoms and molecules at surfaces and interfaces possess energies significantly different from those of the same species in the bulk phase. Generally when two / more phases exist together, the boundary between them is termed an interface. The term ‘‘surface’’ is usually reserved for the region between a condensed phase (liquid or solid) and a gas phase or vacuum, while the term ‘‘interface’’ is normally applied to the region between two condensed phases i.e. solid-solid, solid-liquid and liquid-liquid (immiscible), but gas-gas dose not have surface or interface. Interfacial tension is the force per unit length existing at the interface between two immiscible liquid phases and like surface tension has the units of dyne / cm. The work required to increase the surface area by unit area is termed the surface free energy. At the interface between two condensed phases, the dissimilar molecules in the adjacent layers facing each other have potential energies greater than those of similar molecules in the respective bulk phases. This is due to the fact that cohesive forces between like molecules tend to be stronger than adhesive forces between dissimilar molecules. Thus the interfacial tension is the force per unit length existing at the interface between two immiscible or partially miscible condensed phases and the interfacial free energy is the work required to increase the interface by unit area. Surfactants are termed as surface-active agents also wetting agents, emulsifying agents or suspending agents depending on its properties and use. Surface-active agents are substances which, at low concentrations, adsorb onto the surfaces or interfaces of a system and alter the surface or interfacial free energy and the surface or interfacial tension. [5, 6] Surfactants are monomers, it has a characteristic structure possessingboth hydrophobic groups / non-polar regions (their "tails") usually contain a C12–C18 hydrocarbon chainand hydrophilic groups / Polar Regions(their "heads"). Therefore, they are soluble in both organic solvents and water, so they called amphiphilic. Adsorption may be defined as the process of enrichment of one or more substances at a surface or as the taking up of one substance at the surface of another. It can occur at any type of interface. However, in the context of pharmaceutical systems the interfaces where surfactant adsorption is important are the liquid–liquid, gas–liquid, gas–solid, and liquid–solid interfaces. The surface tension of any liquid depends on the strength of intermolecular interactions within that liquid. E.g. Water having strong intermolecular interactions (hydrogen bonds), has a surface tension of 73 mN m-1; on the other hand, heptane with much weaker intermolecular interactions (van der Waal’s forces), has a surface tension of only 20 mN m-1. Considering a system of two immiscible phases (e.g. 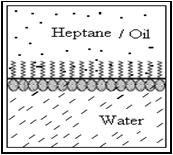 heptane and water), a surface active molecule that is adsorbed at the interface between the two liquids will tend to orient itself with its hydrophilic end toward the more polar liquid (water), and its hydrophobic end toward the less polar liquid (heptane). Thus the surfactant molecules replace water and/or heptane molecules of the original interface. The interaction across the interface is then between the hydrophilic group of the surfactant and the water molecules on one side of the interface, and between the hydrophobic group of surfactant and heptane on the other side of the interface. These interactions are much stronger than the original interactions between the unlike molecules of heptane and water; therefore the interfacial tension is significantly reduced by the adsorption of surfactant at the interface i.e., the inward pull for each phase at the interface is reduced. Fig.No.2 Alignment Of Surfactant At A Liquid- Liquid Interface. 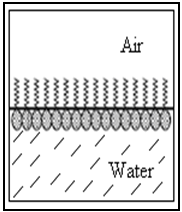 Air consists of molecules that are mainly non-polar and water molecules are polar with high surface tension. Surface tension reduction by surfactants at the air– aqueous interface occurs due to adsorption of surfactants at the interface. When a surfactant is dissolved in water, the presence of the hydrophobic portion in solution disrupts the balance of the intermolecular forces in the bulk liquid. This leads to a rise in the free energy of the system. This means that it is easier (requires less work) to promote a surfactant molecule than a water molecule to the surface. The surfactant molecules therefore congregate at the surface with their hydrophobic tails aligned in the air and hydrophilic head with water, due to strong intermolecular interactions (hydrogen bonds) of surfactant with water. i.e. The presence of the surfactant molecules reduces the net inward pull toward the bulk liquid, and therefore reduces the surface tension. Fig.No.3. Alignment of Surfactant At A Liquid- Gas Surface. In extremely dilute solutions, the drop in surface tension is proportional to the surfactant concentration. However, at a certain concentration, the surface tension drop stops. Surface is saturated, as the concentration increases but the surface tension remains almost constant. After that the point at which this behavior change is observed and surfactants goes in solution to form aggregation of surfactant i.e. micelle. This is called the Critical Micelle Concentration. Fig.no.4. CMC Data for Sodium Dodecyl Sulfate. Physically, what is happening here is the following; surfactant molecules congregating at the surface gradually cover more and more of that surface as their concentration in the solution increases - surface tension drops proportionally. At the point where the surface becomes saturated, micellization occurs in the bulk liquid. The number of surfactant molecules at the surface reaches a maximum, i.e. above CMC - the surface tension remains constant. Adsorption of surfactant from an aqueous solution onto a solid surface may involve specific chemical interaction between the surfactant (adsorbate) and the surface (adsorbent).